The SLE5542 has an intelligent 256 bytes with Write Protection and Programmable Security Code (PSC) and with ISO 7816 smart card interface. 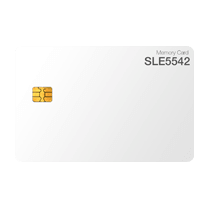 The SLE5542 is a standard, low-cost memory smartcard. It has a 256 x 8 bit EEPROM data memory with 32 x 1 bit protection memory. The SLE5542 is a fully compatible, upgraded version of the SLE4442. To ensure the future availability of this product type, whilst still ensuring backward compatibility to previous products, Infineon has migrated the data carrier family to the IMEM CMOS technology. IMEM is conceived for security applications and offers unsurpassed physical and electrical protection schemes.